Ever since the 1970s when the Club of Rome warned of the strict limits to economic growth, environmental debate has focused on innovation versus scarcity. On one side, techno-optimists believe that innovation can push through any limit: when something gets scarce, we’ll simply replace it with something else. On the other side, eco-pessimists point to the unforgiving math of a growing economy (and population) in a finite world: you can’t innovate around the laws of nature. Catastrophic climate disruption from unchecked carbon emissions is a modern variant of a recurring theme. Today’s techno-optimists argue that human ingenuity will bring low-carbon innovations—the “Cleantech Bulls”—to market fast enough to limit climate risk. Modern eco-pessimists believe that climate disruption—the “Climate Bear”—threatens economic growth itself, regardless of technological advances in clean energy. We’ve all got a stake in this fight. 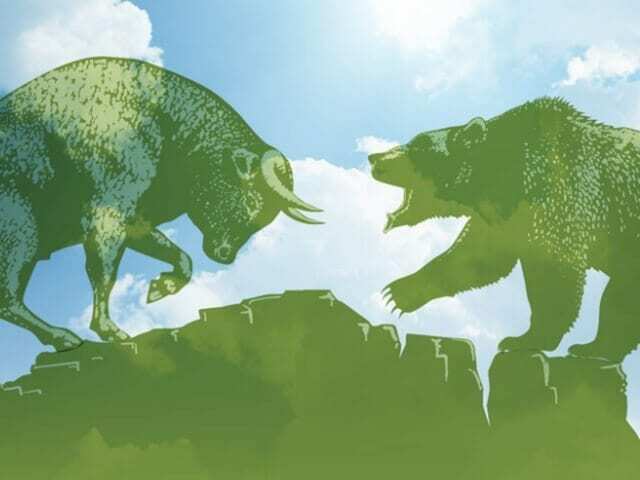 Who’s your favourite: the Bulls or the Bear? The Cleantech Bulls are showing strength. Led by a shining solar sector, clean energy is no longer an outlier. Global investment in clean energy topped $250 billion in 2013, down from over $300 billion due mainly to a steep drop in solar prices, which is a good thing. Venture capital for clean energy startups was $4 billion, and public companies (tracked on the WilderHill New Energy Global Innovation (NEX) Index) soared more than 50%. Clean energy has arrived and is scaling quickly, and Canadian companies are fighting for market share. Solar energy hit an inflection point in 2008. Since then, solar panels have dropped four-fifths in price. High-profile casualties, like Solyndra, point to a maturing industry: consolidations bring economies of scale. Subsidies seeded the industry, but now solar often competes on its own—the training wheels are coming off! New installs hit 36 gigawatts (GW) in 2013, with 45 more expected this year (a GW is like a large nuclear or coal plant). Rooftop solar competes with the retail cost of electricity—it’s on a tear. Companies like SolarCity systematize installation and aggregate assets, which brings debt and even lower costs. In fact, so much rooftop solar is going up that utilities must fight for profits while adapting to the technical challenge of altered demand curves. Large-scale solar farms must—and sometimes can—compete on wholesale costs. A recent court ruling established that large-scale solar farms are a better deal for local utility Xcel Energy than new natural gas—in Minnesota! Even the oil-rich Middle East will be a $50 billion solar market by 2020, as governments spin down subsidized oil generators. Today’s solar panels are commodities and future cost reductions will come from next-generation panels and the “balance” of systems, including inverters, wires and racking. Watch for Kingston, Ontario’s Sparq Systems Inc. on rooftops. The company’s micro-inverter is smarter and cheaper than current market leader Enphase Energy, plus they’ve eliminated electrolytic capacitors, which are the Achilles’ heel of reliability. Also of note, Toronto’s Morgan Solar Inc. is set to make grid-scale solar competitive with coal for the first time, as the company hits the market with its much-anticipated and highly efficient solar optic and low-cost tracker. But the sun doesn’t always shine, nor does the wind always blow. Energy storage eliminates intermittency and is set to explode. Early movers in Germany, Ontario and California are creating initial demand for a market that is expected to reach 6 GW annually by 2015. Canadians to watch include Temporal Power, whose flywheels eliminate fluctuations for fine control; Hydrogenics, a company that can turn excess wind into a natural gas equivalent; Sustainable Energy, whose solar panels talk with batteries; and, eCamion, whose portable lithium battery packs can create storage where it is needed most. Currently, the lowest cost grid-scale solution is Hydrostor. The company’s pilot underwater compressed air energy storage system will be operating in Toronto by early summer. In congested markets like Toronto, Hydrostor is a better deal than new natural gas peaking plants or increased transmission capacity. Hydrostor’s first commercial agreement was signed in Aruba last year, and that system will be running by fall 2014. Here’s the real market kicker: wind and solar developers who integrate Hydrostor beat diesel as a reliable 24-7 supply. The Bulls look strong. What are they up against? Warming is less than 0.8°C and the Climate Bear is already growling. Opening shots typical of this fight—including severe droughts like those experienced across California and much of the United States; violent changes in rainfall like those that flooded Calgary and Toronto; the horrific typhoon in the Philippines; and a rapidly melting Arctic—are taking their toll. That’s nothing compared to what the Bear has in store. We spend $5 trillion on fossil fuels every year, including direct subsidies of $600 billion. ExxonMobil and BP’s own projections—which optimistically assume that “governments will continue to gradually adopt a wide variety of more stringent policies to help stem [greenhouse gas] GHG emissions”—have us shooting well past 4°C. The World Bank calls that “devastating,” and all governments have agreed that 2°C is the safe limit. Realistically, business as usual brings at least 4 to 6°C of warming. That’s just not something our global economy and shared civic structures can survive. Think of added heat as energy: we’re adding the equivalent of 400,000 Hiroshima atomic bombs per day to the atmosphere, 365 days per year. That’s an awful lot of energy the Climate Bear can use to wreak havoc! It’s not enough for clean energy to beat fossil fuels on price or performance. As Vaclav Smil, distinguished professor emeritus at the University of Manitoba, points out, it takes nearly a century for new, better energy sources to replace the old. That’s the nature of infrastructure. As carbon levels shoot past 400 parts per million, a more appropriate question is: can the Cleantech Bulls step up fast enough to wrestle down the Climate Bear? That depends on how hard we try. The Bulls have muscle, but market forces are not enough to win the fight—the Bulls need steroids! Christiana Figueres, executive secretary of the United Nations Framework Convention on Climate Change, estimates that we need to triple clean-energy spending to stop the Bear anywhere near 2°C. Aggressive market-making starts with a price on carbon, then accelerates capital flows with government-backed Green Bonds, aggressive mandatory targets, elimination of regulatory barriers and market pull from militaries and governments. Put another way: to stop warming near 2°C, we must leave three-quarters of fossil fuel reserves in the ground as stranded assets. Unburnable reserves mean that traditional energy stocks are way over-valued—that’s the “carbon bubble.” We might engineer a soft landing: convert traditional energy companies to income trusts with known cash flows and depletion rates, and use money earmarked for exploration (for more unburnable reserves!) to buy back shares and shrink the exposed asset base. As an investment class, the Cleantech Bulls clearly face a rapidly growing global market, regardless of whether we feed them the steroids they need in order to battle the Climate Bear. What keeps me up at night, though, is not the health of the Bulls, but the strength of the Bear. Feature photo credit: The Canadian Business Journal – Feb 2014.